Download this free sample excerpt from the 2018 Pet Groomer’s Appointment Book & Marketing Planner. Includes the July 2018 Grooming Business Success Planner that outlines the month's promotions. Plus, one of July's Printable Promo Pieces to use in your pet grooming salon. 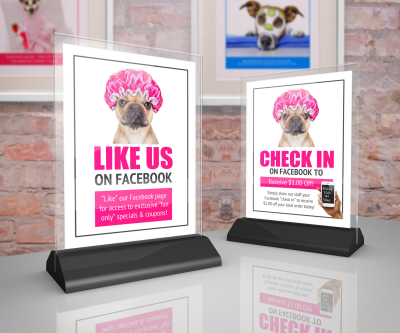 This month's printable includes a printable Facebook "Like" sign to encourage customers to connect with you on Facebook. Get more page likes quickly! This free offer is available until 7/3/18. (We hate spam as much as you do, so we never share your information with any other entities. By entering your email address, you will immediately be taken to the free download page and you will also receive notice of future free downloads each month. You can unsubscribe at any time if you decide that you no longer wish to receive future freebies) Free offer available until 7/3/18. This month's free printable was a sample from our Groomer's Profit Kit, and is included in all paid editions of our kit. You can get purchasing details here.